My name is Dante DeFrancisco. You may have heard of me. I am proud to say that I am the owner of the HotPets pet store chain, which has earned me a lot of money over the years. Much of that money I feed back into helping to save animals, although I admit to keeping a lot, too. And, no, we don’t sell pets at the HotPets stores. We just sell food and other pet supplies. We do, however, sometimes sponsor pet adoption events at our stores, when shelters, primarily HotRescues--the shelter I fund--bring in rescued pets for people to adopt. I started out having parts of my life chronicled by Linda O. Johnston when I began dating Kendra Ballantyne, the star of the Pet-Sitter Mysteries. The Pet Rescue Mysteries are considered a spinoff of that series. 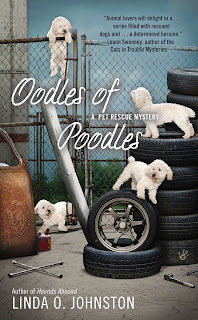 I do appear in nearly every Pet Rescue Mystery, partly because of the funds I supply to Lauren Vancouver, the manager of the shelter who also, like my dear Kendra, has gotten involved in solving mysteries. I’m not sure why either of them keeps having people they know murdered, but I applaud them both for helping their innocent but suspected friends by figuring out who really did the killing. By the way, I also fund HotWildlife, a rescue organization for wild animals that was featured in the Kendra mystery HOWL DEADLY. The most recent full-length Pet Rescue Mystery was OODLES OF POODLES, which was about rescued poodles playing the roles of rescued poodles in a movie being filmed here in L.A., where HotPets is headquartered. I got Lauren involved in that because I was a co-producer of that film, which meant that I also contributed a lot of money toward its production. I admit that I was not happy when the director of the movie, Hans Marford, was murdered, although I learned that he was not being as careful as he should have been in making sure that all of the animals in the film were treated well. I’ve heard that there was also an e-novella that was recently published in the series: NONSTOP SPANIELS. And the next full-length book will be TEACUP TURBULENCE, to be published in January 2014, featuring an organization that flies rescue animals who are unwanted in the areas where they’ve been saved to other places where they are more likely to find homes. I would like to encourage you all to adopt pets, and definitely to patronize HotPets for all your pets’ needs. And I would highly recommend that you read the Pet Rescue Mysteries, and would do so even if I didn’t appear in them. My 13 year old Lab/Boxer mix, Holly, is a pound pup. We've had her since she was about 3 months old. Rescues are the only way to go. I did order the first book in the series, looking forward to reading it soon. Sorry I wasn't able to respond to your comments before but my contact to the blog, Linda O. Johnston, was off at a conference without good Internet access. Thanks for posting about Holly and rescues, Lisa Ks Book Reviews. I like your attitude. And I join in with Lauren, and with Linda, too, in thanking you, Aurian, and hoping that you enjoy reading the book.